This Easy Mushroom Soup can be made in under 30 minutes and provides lots of savoury flavour from both portobello & button mushrooms. There’s fresh thyme in there and just a touch of cream. Perfect for a light lunch or even better with a sandwich for an easy dinner! This Asparagus Spinach Soup just looks and tastes like a big ol’ bowl of springtime goodness. It’s a light soup that has a few simple ingredients and takes minutes to make. When you have so few ingredients, they really shine through. Sometimes simple is best, don’t ya think? Two bowls of asparagus spinach soup alongside some pesto and parmesan cheese. This Cauliflower Curry recipe has a rich coconut milk base, lots of cauliflower (of course), kale and red lentils. Combined with a little pop of sweetness from raisins, it makes for a comforting, budget friendly dinner option that your family will love! This vegetarian lasagna made with a whole bunch of vegetables including eggplant, spinach and mushrooms – it’s comforting and delicious! 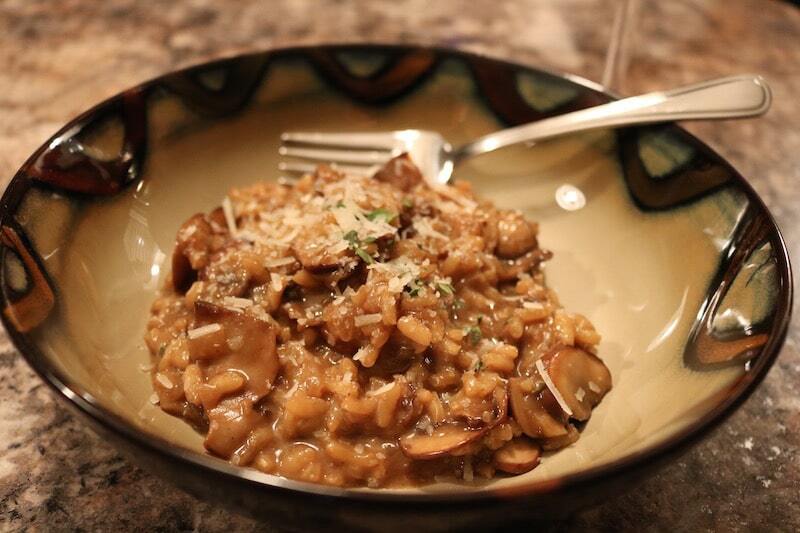 This Easy Mushroom Risotto with thyme is creamy, comforting and delicious! Loaded with rich, savoury mushroom stock and lots of fresh mushrooms, it’s a recipe you’ll want to make again and again.